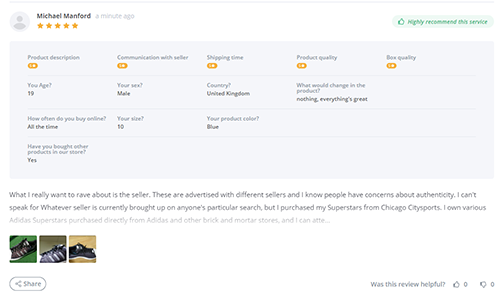 It is our great pleasure to announce the official launch of our new feature - Additional Questions for our customer reviews widget. In this post, we will show you how to setup and get the maximum out of it. Note:This feature is available only for our Professional Plan users. Bellow, we will explain how to configure and use each of this type of question. 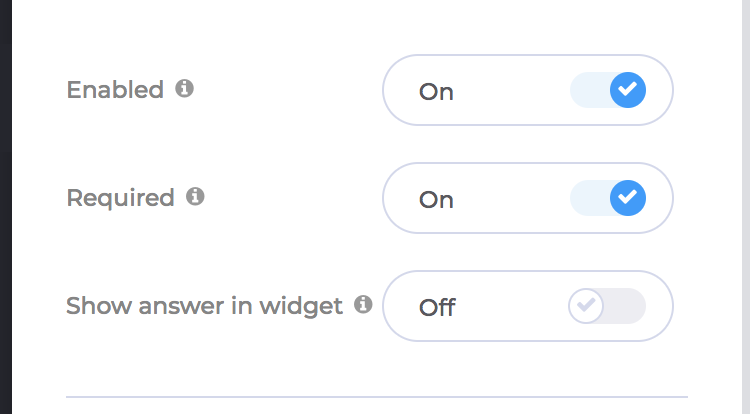 Enabled - this jumper will enable the current question type in the widget so you can start asking your customers specific questions. Required - by enabling or disabling this jumper you can make the current type of question mandatory or optional. If it is "On" then your reviewer will be prompted to answer the question to continue. 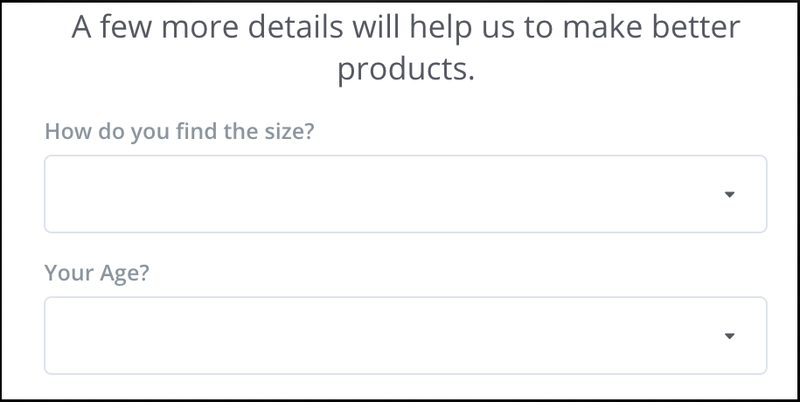 Show answer in widget - this option gives you the possibility to show or hide your customers' answers in the widget for the current question. It as special, stand-alone question type, because it is shown in a special way in the widget. 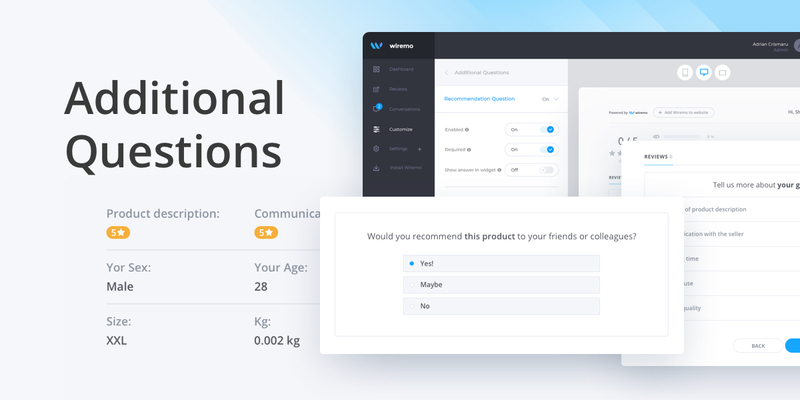 We've designed it to give you the possibility to ask the most popular question to a customer - "Would you recommend this service/product to a friend?" Even if this question is separated from other ones, it can be edited as you wish. 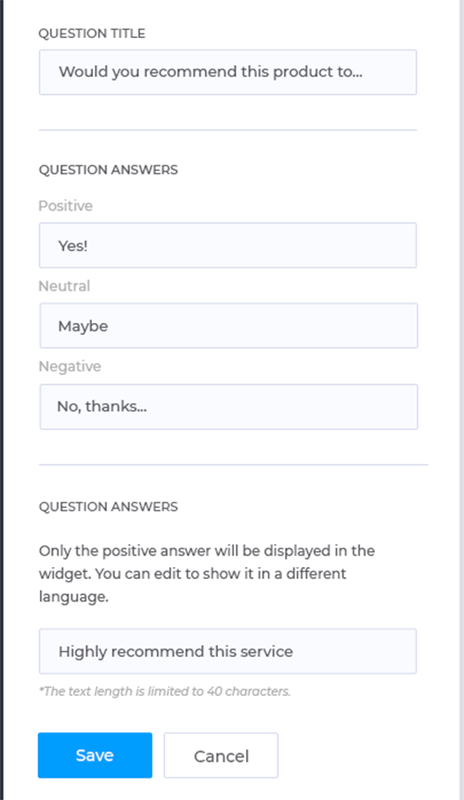 You can change the question title and the answers (Positive, Neutral and Negative). Also, an important thing is that you can change the text that will be displayed in the widget. Only the positive answer will be displayed in the widget. The text lenght that will be dispalyed in the widget is limited to 40 characters. Specially designed for those cases when you need to rate some special customer experience. Settings for the rating questions are quite simple. You can edit the questions block title and of course the text of the question. To add a new additional question just press on the "Add more" link. The number of rating question is limited to 5. A simple type of question when you need to get a short subjective answer for a specific question. Settings for the "Input Box Settings" are similar to the "Rating Questions". 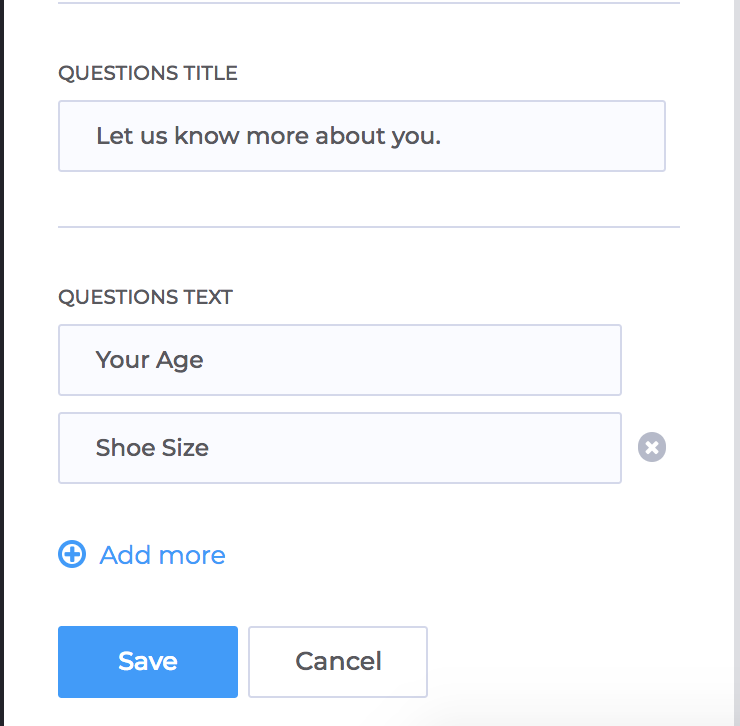 You can edit the questions block title and of course the questions' text. 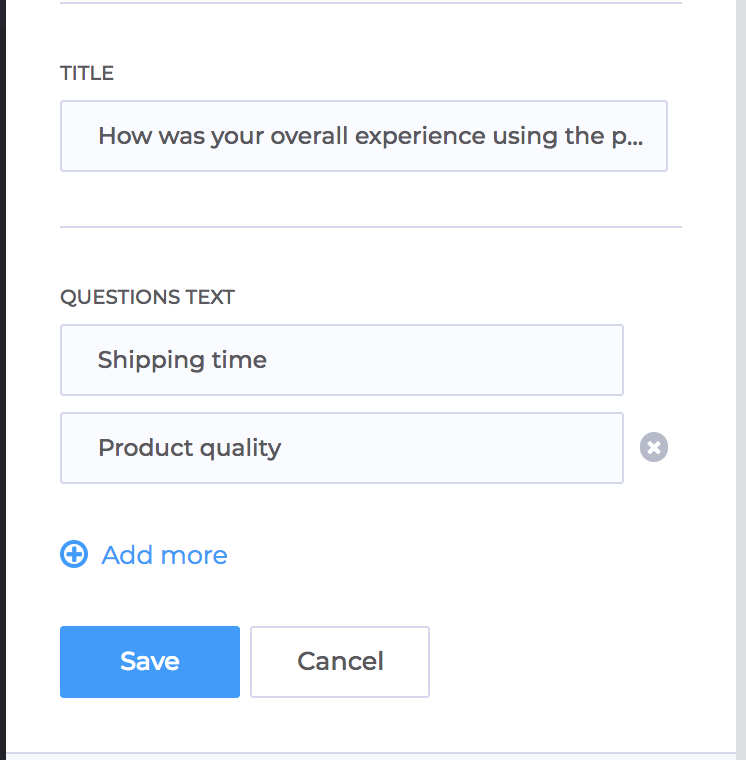 To add a new additional question just press on the "Add more" link. 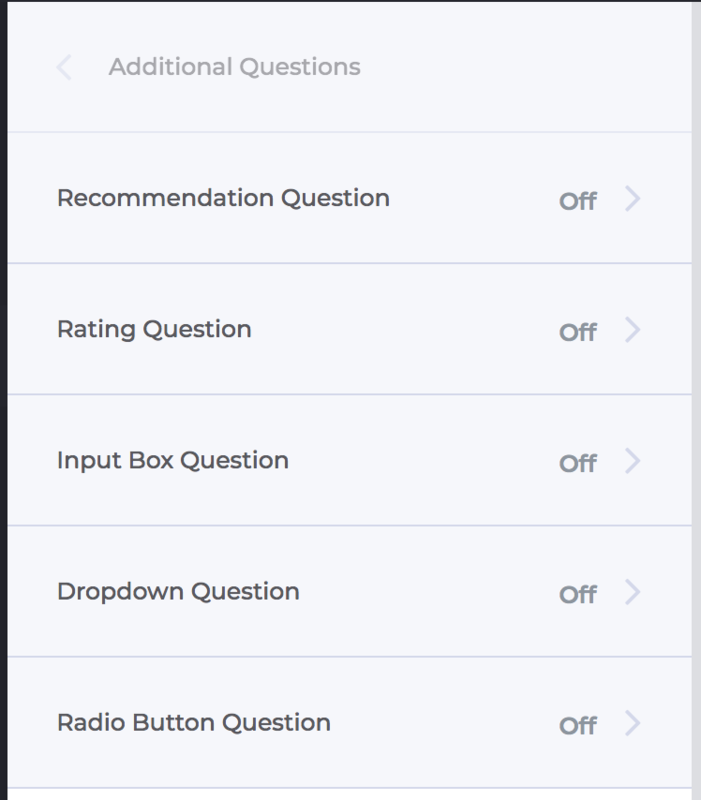 The number of Input Box questions is limited to 5. This question type provides the possibility to ask questions with multiple answers in a dropdown. Question text - it's the question text itself. The answers - you can provide your customers with as many answers as you need. Type them in the Select Options input box, comma separated. To add a new additional question just press on the "Add more" link. 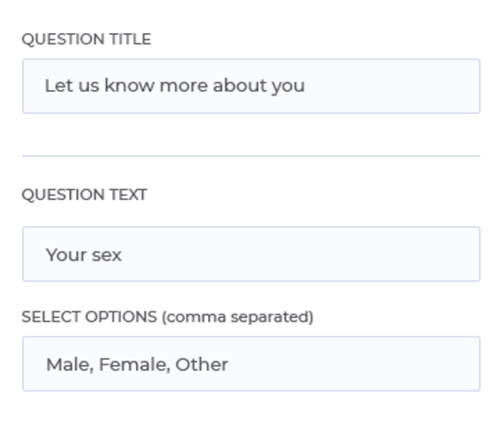 The number of Drop Down questions is limited to 5. A single question with maximum 5 radio button answers. The customer can select only one answer. As a single question, it has a question title that can be edited and you can add up to 5 answers. To add a new answer simply press on the "Add more" link. As we wrote above, you can enable to show the answers in the widget. Below is a screenshot where is displayed an example with answers to all the questions type. As you can see every type of answers is placed in a separate line. Also, you can see how it's being displayed the answer for the recommendation question. You can disable a question type and change it at any time. This will not affect your already existing answers. All the questions and answers will be saved and you can access them at any time. Once you disable showing answers in the widget, it will affect only your further additional questions. All the existing answer will still be present in your reviews. The recommended question length is 25 characters. We recommend you to use no more than 3 additional question at the same time. Try to make your questions short and clear. Test the questions by yourself. Make sure the answers are looking good in your review widget.